When you see a place with all 5 stars you start to think it is too good to be true. Well lets just say if I could give them 10 stars I would! This place really deserves it though! Customer service is HUGE in my book. The second I walked in they greeted me even though they were eating lunch and had me in and out within 15 min. Being a female going in a place like this usually is intimidating but not here. Every single person that spoke to me was so nice. Keep up the great work guys! Anytime I need anything this will be my go to place! Excellent Excellent!!! !,, Exceptional work, I'm very happy with my exhaust on my 2013 camaro zl1. What a big difference this has made on my vehicle. LOOKING FORWARD TO YOU GUYS INSTALLING MY INTAKE.. THANK YOU GUYS SEE YOU SOON!! 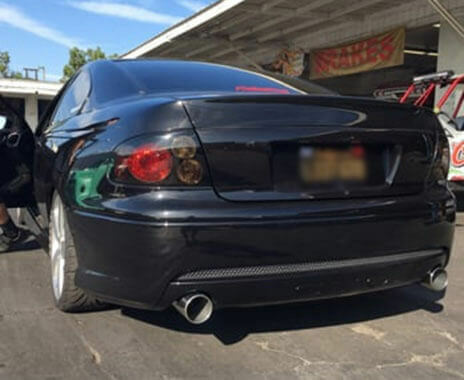 My husband had his exhaust done there about a month ago, so I decided to have my cat back system done on my 2004 Grand Am. Sparky and the crew are genuinely nice and helpful. They don't try to get over on the customers, especially women. The waiting room was clean, the work areas were lean for what they do. They did a great job and we are customer for life! Oh, and they weren't bothered by me going out every so often to take pictures of the progression. Loved that. Great little shop. I had a quick little job. I needed two bypass pipes welded on my Porsche mufflers. They took me right in and got to work. Clean shop with a friendly crew. Quality welds too. Couldn't be happier. Excellent customer service, amazing quality and they take a lot of care and passion into each job. I came in to have some adjustments done to my existing exhaust setup and to have some tailpipes swapped out. I couldn't be happier with the way I was treated from when I arrived to when I left. I felt like I was hanging out in a buddy's garage. Very friendly. They put a lot of precision into each task. My job took around an hour or so I was able to see a couple other small jobs come in and out. They were efficient and just as courteous to the next person as they were to me. The quality of the welds, the care they put into making sure everything hung exactly where it was supposed to, it all surprised me. It's hard to find a shop that cares so much. Thanks again to the whole crew over there. You guys rock. We'll keep coming back! I love this place, honest, reliable. Best custom shop I have ever visited. One call convinced me how professional and honest they are. Zack built a killer exhaust for my Lexus RC 350. Two thumbs up! Roger is great to work with. He installed an X-pipe on my 2006 GTO and also fixed my brother's 3" system on his 2011 5.0 Mustang. I will always come back to Roger's for all my exhaust needs. His welding is fantastic, and he is very reasonable and straightforward with pricing. Rodger was awesome and gave me a great deal. That shop is the best in Fontana. Would go again. The BEST custom exhaust shop in California!!! I've had 3 vehicles piped up by these guys, fully custom, from scratch! They don't use pre-bent bolt on pipe, everything is done with straight exhaust pipe, bent with a mandrel and robot quality welds! Moved to central California a while back and still make the 400+ mile trip to get my exhaust work done by them.. Totally worth it! Sparky is the man! They'll pipe up anything you got, muscle-imports and you'll never have a problem! We offer service on Saturday by appointment.